Posted on February 4, 2013, in Communication and Conflict Resolution, Israel and tagged ethnicity, Intractability, nationalism, Palestinians. Bookmark the permalink. 2 Comments. Our American experience clearly demonstrates that sports is an effective medium for breaking down walls and fostering subsequent communication which will ultimately lead to understanding. 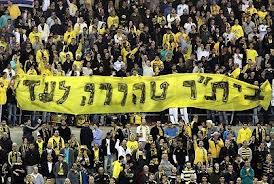 First, though, I’m not sure that a team which traces its DNA to Likud is a good example to cite for eventual tolerance. I’m thinking more of the examples of Jackie Robinson domestically and Jesse Owens internationally. Their undeniable excellence, backed by a steely pride and indomitable spirit forced the world to first accept and ultimately embrace — not just these men as individuals, but their brothers and sisters — as equals. Hazardous, arduous, zig-zagging, still-progressing journey? No doubt. But the communication engendered on the playing fields led to understanding and acceptance in so many more fields. Sure, you are right Paul. Sports can be a very integrative activity. Lots of peace and conflict resolution efforts use sports to build camaraderie, cooperation skills, and common identities. But the research remains interesting with respect to group level perceptions. One’s identification and attachment to a group, even the sports group, can be so strong that it intensifies intergroup conflict. This seems to be what is happening with the soccer teams I referred to. Think of hooliganism in Great Britain as well as fights in the stands in the United States. Group identification can be a source of common purpose, or a threat.